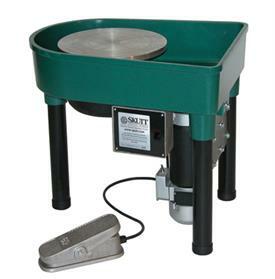 The combination of the Built-In Splash Pan, Heavy Duty Frame, and ridiculously strong motor make the Professional a popular choice with big pot potters. Some potters prefer the added heft of the built-in splash pan for added leverage. Upgrade to the ultra silky smooth performance of the SSX controller and you may never have to make another potter's wheel purchase again.